Born on 18th July 1796 at Connorville close to Ballineen in Co Cork, Feargus O’ Connor was the son of Roger O’Connor and Wilhelmina Bowen. Both his father and more famous uncle, Arthur (a Barrister, former MP and High Sheriff of Cork) were arrested in 1798 for activities connected to the United Irishmen. Arthur was exiled to France, where Bonaparte welcomed him as an official representative of the Irish people. Roger’s family were also dispersed for some time as a result of his ongoing brushes with the law. 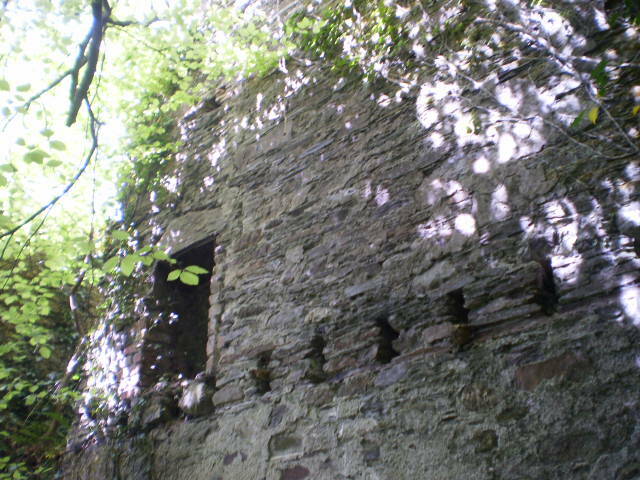 After some teenage adventures in England and Ireland, Feargus acquired Fort Robert, Dromidiclogh near Ballineen in West Cork from his uncle Robert Connor in 1820 and worked the attached farm alongside over 100 of his tenants. At this time, rural areas of County Cork were hotbeds of Whiteboy actions led by the infamous and mysterious Captain Rock and O’Connor may have become mixed up in these activities. He had also addressed his first public meeting at the original Catholic Church in Enniskean but due to the treasonous nature of his comments, he disappeared to England in 1822, where he later qualified as a barrister. Returning to Cork he defended many ordinary people in the courts at the time. However his experiences led him to become angry at the lack of civil rights, a critic of tithes (payments to the Protestant church) and more active in politics. He did not support Daniel O’Connell’s Catholic Emancipation campaign contending that it was limited emancipation and O’Connell was “the only Irishman to have benefitted”. In any event he was more interested in the Repeal of the Union movement and his brilliant oratory skills helped him to sway huge crowds at public meetings. He addressed a crowd of some 50,000 people in Dunmanway in 1832, while also holding a large campaign dinner for 500 in Enniskean village. Large in stature, fiery and red haired, self-confident, charming, defiant and passionate, he engaged huge crowds and was a natural leader. Occasionally these meetings could be rather robust affairs and O’Connor became involved in many altercations. He was described by his friend and neighbour William J O’Neill Daunt as being “indefatigable in agitation”. His increasingly radical views gained many supporters among disenfranchised tenants, labourers and working class people of no property. He challenged openly the aristocratic Tory grip of politics across County Cork and in 1832 surprised all when he was elected MP for County Cork, breaking the political glass ceiling of the landlords, (although one himself!). His victory sparked mass evictions of hundreds of tenants along the Bandon Valley by Lord Bandon. The landlords never forgave him and those evicted never forgot either. Yet he continued to engineer electoral victories in a corrupt system by somewhat pragmatic methods in many Cork towns against a backdrop of increasing anti tithe violence. (In December 1834, 12 people were killed when troops opened fire in Rathcormac, Co Cork). In the House of Commons, O’Connor was very isolated and gradually split from Daniel O’Connell accusing him of selling out the Irish people on Repeal, especially after the Liberator’s agreement to the Lichfield House Whig Compact. 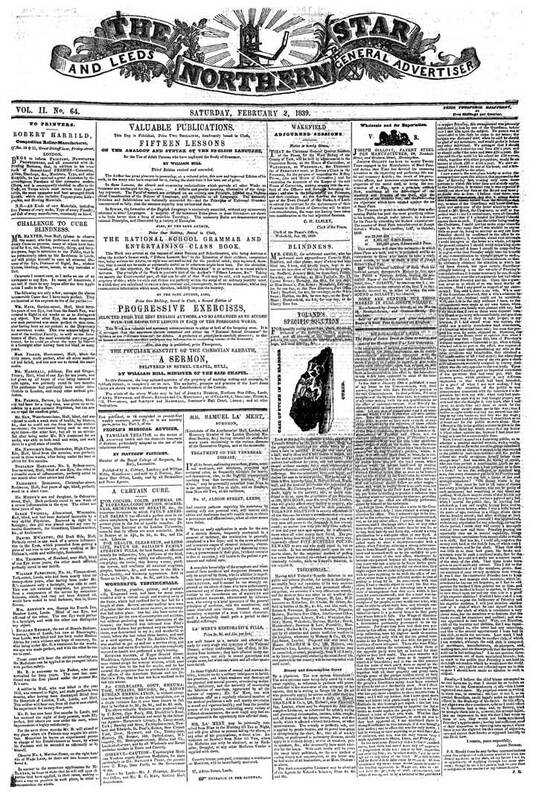 O’Connor and the working classes became alienated even further from O’Connell due to O’Connell’s regular attacks on the emerging trade union networks. 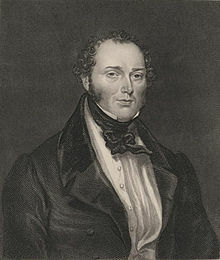 Re-elected in January 1835 as MP for Cork, he was soon disqualified from the House of Commons in June when a Select Committee found he had not enough property or income to qualify in the first place. Being unable to contest the Cork election again he then turned most of his attention to English politics. Later in England in September 1835 O’Connor helped found the Great Radical Association, which united many radicals and agitators and which sought universal suffrage (for men), voting by ballot and the removal of property qualifications for MPs. He possessed ferocious energy and spoke at huge meetings in support of working peoples’ rights and is regarded by many as one of the founders of Chartism based on the later People’s Charter which also sought the earlier principles espoused by O’Connor. Feargus was becoming the “Lion of Freedom”, adored by countless thousands, yet remaining a very divisive figure to others. 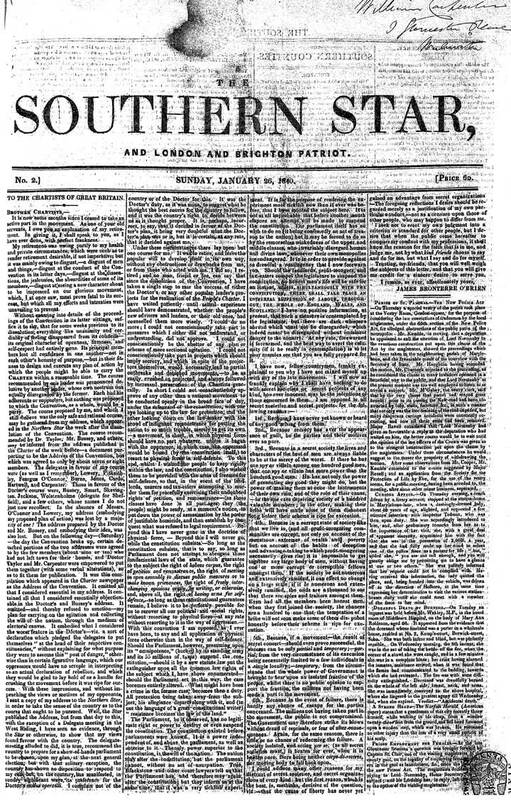 He founded the Northern Star newspaper in 1837 in Leeds, which was hugely popular and which promoted the ideas of Chartism throughout Britain and supported the People’s Charter announced by the London Working Men’s Association in June 1838. O’Connor was a vigorous campaigner, an accomplished orator, a smart agitator and he spoke at meetings attended by hundreds of thousands of people. Unfortunately he also became involved in the many irrelevant disputes which weakened the Chartist movement. Yet he always raised the Irish grievances whenever he could. The authorities ensured he was charged and imprisoned for 18 months for seditious libel in May 1840 in York Castle. While weakening his direct control over the Chartist revolution, O’Connor became a martyr for the now huge movement. 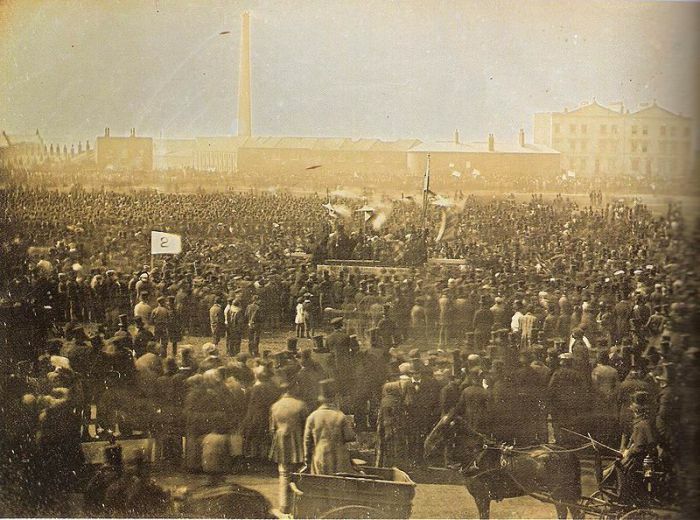 In spite of many setbacks, widespread violence arising from industrial strikes especially in 1842, the rejection of parliament petitions, an over ambitious land plan, O’Connor and others kept Chartism central to the political agenda throughout the 1840s. He was elected as an MP for Nottingham in 1847 and became an even bigger thorn in the side of the Establishment (both Whigs and Tories in Parliament). Eventually worn out by years of campaigning, wounded by arguments within the movement, lack of finances and the ongoing efforts of the Establishment to be rid of him, O’Connor experienced poor health and mental difficulties, he was eventually sent for treatment to an asylum where he remained for several years. He died at his sister’s house in Notting Hill on 30th August 1855 and is buried at Kensal Green Cemetery. Vast crowds attended his funeral in London and the gates of the cemetery were “unceremoniously broke open” by the throngs. A large monument was erected over his grave. Another monument was erected in Nottingham by his admirers. Chartism, riven with disputes between reformers and militants receded in the 1850s and much of its vision in education, parliamentary and land reforms and universal suffrage came to nothing in the short term. However the awakening working classes proceeded to organise and consolidate trade unions, co-operatives and friendly societies and absorb new socialist and democratic ideas. Wage negotiations commenced. While political reform took longer…… for many on the ground, O’Connor had led the way across the revolutionary Rubicon! As early as February 1838, O’Connor as quoted in the Bolton Free Press (Dorothy Thompson The Chartists) had declared that society is divided into two classes…. “The rich oppressors and the poor oppressed. The whole question resolved itself into the battle between labour and capital”. He emphasised the need to create independent working class organisation. 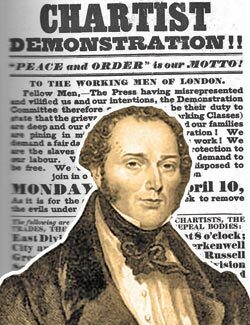 Feargus had introduced powerful ideas to the workers and he would not be silenced as he understood how to promulgate these ideas fearlessly through his newspaper, through vast meetings and through Chartism. Establishment attacks tried to destroy his character portraying him as a colourful and dangerous eccentric of this period yet the West Corkman remains the one innovative, questioning and radical voice in the complex tapestry and history of agitation for full political rights for all in Britain and Ireland. Today, O’Connor appears to have been consigned to occupying a marginal role in Irish and British history, although he was a central and significant figure in the British Revolution. In his publication “Feargus O’Connor …a Political Life” by Paul A Pickering (published by Merlin Press 2008), Professor Pickering contends that O’Connor has not been “treated kindly by history” and his book is a plea for a place in Irish and British history for Feargus, as “he had earned it”. 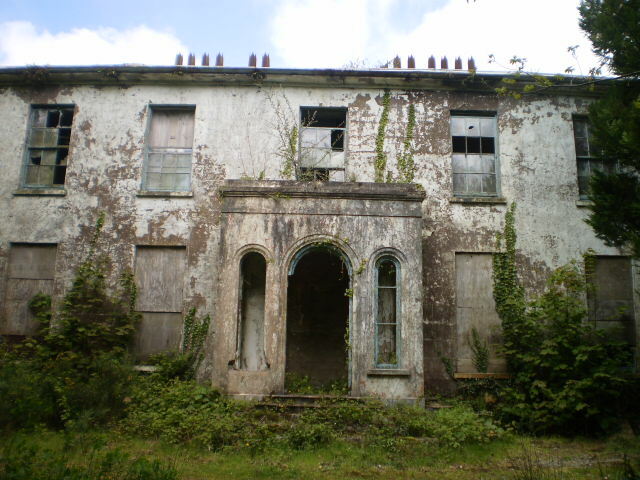 Carrickmore House – extension of the original Connorville at Ballineen – both in ruins now. Today, Connorville and the later Carrigmore House shamefully lie in ruins alongside the present day Carbery Milk Products factory at Ballineen. Cattle graze beneath the walls of Feargus’s old home Fort Robert (built in 1787) which is nearby. Very little remains of the old church at Derrigran, Enniskean where he made his first speech, and today a parochial house stands on the site. Alongside the “Idle Bridge”, on the main Bandon/Dunmanway road (a bridge built by Roger to carry water from a never completed Blackwater river diversion on the O’Connor lands at Manch), a small plaque unveiled in 1999, commemorates Roger and Arthur O’Connor and their role in the United Irishmen. 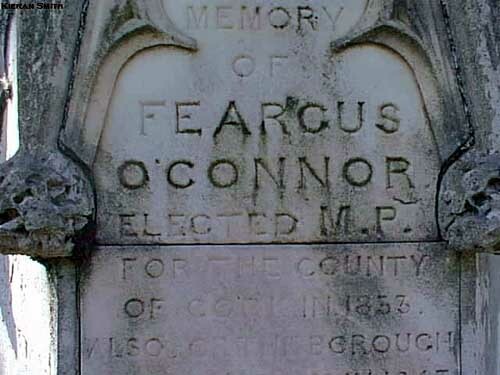 For Feargus O’Connor…the Lion of Freedom… there is no monument in his native county! Cllr Warren Davies, is a Labour Councillor, who represents Baird Ward in Hastings in East Sussex. For 27 years he has taught history, politics, Sociology and anthropology. Warren will speak of “Feargus O’Connor – The Corkman behind a British Revolution” on Saturday 5th August 2017 at 2.30pm at the Maldron Hotel. Judge Connor sold Fort Robert to my grandfather, William Buttimer, in 1935 for £500. The old house is in ruins but my grandfather restored all the farm buildings. Alas, they too are now in ruins. But the farm is still thriving and owned by my aunt, Kitty Buttimer. My dad, who is now 90, remembers going to Fort Robert to help with the farm work after school in the 1930s.